This past weekend was all about my favourite snack in the world - SHRIMP. I ran my furthest run of 12 miles and OH MY GOODNESS were my leg muscles tired. In order to boost my recovery time, I had my fiance grill me up some. While shrimp may be small in size, they are huge in terms of nutritional value and the health benefits they offer. In a large bowl, combine shrimp with all the ingredients, and toss to coat. Refrigerate for 30 minutes. 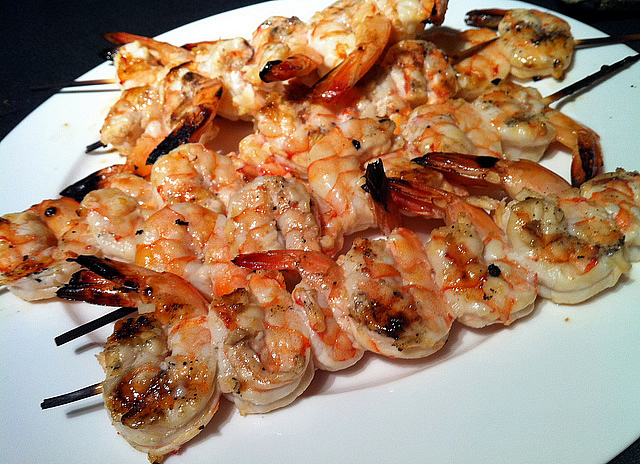 While the shrimp is marinating, place wooden skewers in a bowl of water to soak. Preheat grill or a grill pan to medium-high heat. Thread a few shrimp onto each skewer. Cook about 3 minutes per side, until shrimp is cooked through.Serve these hot or cold. i'm a sucker to prawn and shrimp.....gonna have to try this recipe!